Do your mornings support your joyfully focused lifestyle? 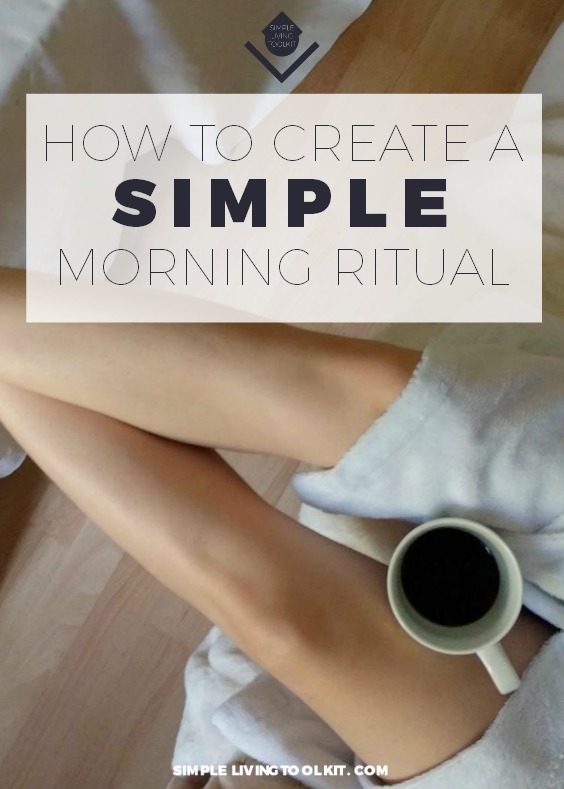 Does the A.M. help you keep it simple and purposeful? If not, take a look at what you do first thing in the morning. I'm talking about the 1-3 hours after you wake up. If you feel like you're stressed and putting fires out all day, like your actions are directed by someone else's priorities instead of your own, you can change that. You can feel more in control. More calm, focused, and steady. Take out a journal, notepad, text document, or Google Keep note. Ask yourself what you need to do each moment in the morning to stop just going through the motions and create the purpose-filled, joyful, simple life you desire. Then write it down along with about how much time each step should take. Ask anyone involved if they can support you in creating this morning ritual, being sure to tell them how the whole household will benefit. Post a reminder by your bed so that tomorrow morning you can remember to begin the new habit of doing your morning ritual upon waking every day. Right now I feel happy with my morning ritual. It's something I enjoy tweaking as I learn about what works for me. I change it up seasonally and as I begin to incorporate new habits into my life. Sometimes life intervenes and my morning practice doesn't happen exactly as I plan on. But my day tends to go the best when I start my day off with a focus on meaning and attitude. What does that mean? It means that everything in the morning gets me feeling good and sets the tone of the day. I take a sip of the coffee my husband has placed on my bedside table. He is teaching our son to make breakfast and coffee so they usually bring me some. I take some deep breaths, stretch, and think about the many things I have to be grateful for. I make my bed and get dressed or put on a robe and save getting dressed for later. I find my husband and son and give them hugs. I have fifteen minutes of one-on-one quality time with my son playing any game he chooses. I read, listen to, or watch something inspiring (no news or Facebook) like a personal development book, audiobook, or an uplifting video. Writing time! I journal each day to feel balanced. I writing about my purpose, my focus, my gratitudes, my hopes, desires, goals, visions. I create on the page what I want in my life. I write down private thoughts I want to process and I also often work on a book or other writing project. I write down ideas for anything including books, blog posts, business, and life. If this post helped or inspired you, please like and share below or give me feedback by emailing hello@genevieveparkerhill.com.